Callisthenics are essentially bodyweight based exercises designed increase body strength, body fitness, and flexibility. Callisthenics does this through a variety of classic functional movements such as pulling or pushing oneself up, bending, jumping, or swinging, using only one’s body weight for resistance; usually conducted in along with stretches. When performed vigorously and with variety, calisthenics can provide the benefits of muscular and aerobic conditioning. In addition to improving psychomotor skills such as balance, agility and coordination. Many consider calisthenics as “movement through space”, meaning you can move freely without any restriction blocking your full strength. BarzGlobal bring their renowned Sunday community Callisthenics session to the Bold Tendencies rooftop this summer. 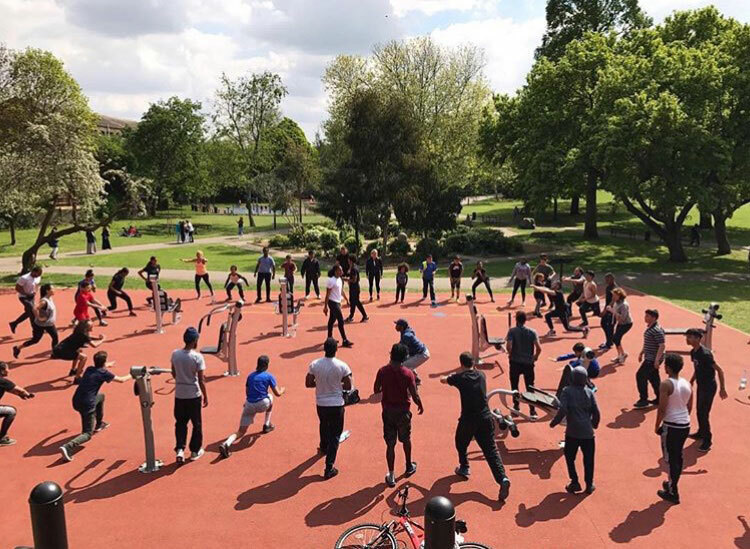 BarzGlobal is one of London’s leading proponents of Urban calisthenics i.e. on the streets. BarzGlobal will use the brutalist backdrop of the Bold Tendencies Car-park to get you bodied demonstrating their agility and developing yours in our concrete cathedral. This session will combine functional movement, natural body weight training and flexibility training in an intense 2 hour programme aimed at all ages and all abilities. The session will be run by BarzGlobal’s fully qualified and experienced instructors and will provide an all-round, well balanced fitness experience, combining exercises and activities that target the key aspects of movement, and finishing off with fruit and refreshments for all!